A wonderful free flowering species Daphne Genkwa is under utilized in Australian gardens. Masses of lilac flowers held close to the upright stems in spring. This is a daphne that actually grows well in Australian gardens and prefers a little for sun and warmth than other species. Daphne Genkwa is originally from Southern China. 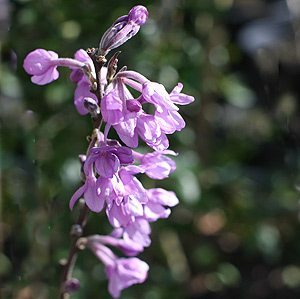 The flowers are only faintly scented, however the foliage that follows the flowers is attractive. Although Daphne Genkwa is the species at least two varieties are available, one with oval or rounded foliage, the other with longer lance shaped foliage. A little variation in flower color as well with some having very pale, almost white flowers. Best planted where it can have a little room to grow, the long stems to around 1m look better in the open. Plant in a humus rich moisture retentive soil. Plant in full sun, although in the hotter areas of Australia we do think just a little protection from the hot afternoon sun is advised.